I want to say I made this guide build because I see most knight now turn themselves to xbow. I just want to encourage some knight to try to play 1H and see how useful it is. And this guild is only for only War and CD on my favorite play style only. You don't need to follow my guide. Reason of I do crit type is normally knight already have at least 10k def+ and 35k HP+ with buff, With that high def and hp I don't need to do more tanky since I am 1h Knight that do closed range and I will get party healed from cleric anyway. So I make crit type as high crit, none of them can crit me except Axe Champ. This will help to be more tank for me instead of building pure def. And you can get crit on attack. Dex: It is second stat to give AP and more Physical Block. So It is needed beside Str. Con: You would wonder why I have low con. I could say I don't need much accuracy to attack all class except Raider and some high dodge build scout. And even if I get high con, most of knights are using Chiva or Rienforced, you won't get enough accuracy to properly hit them anyway. So I better use Skill point into other stat. Sen. As I said, I am crit type. So this is third stat It needs beside str, and dex. Cha: I dont have cha stat because I don't focus to do debuff. And my build don't have HP, AP and Def buff. Sacri: Now I max it to lvl5 that make 10 secs cooldown. This will be useful along with skill on knight tab we will get final aoe that apply 50% taunt. Try to use it after you use shield spike. It can make sacri 2 times in 20 seconds of shield spike including impact wave. Also both debuff at lvl1 is just help a bit. 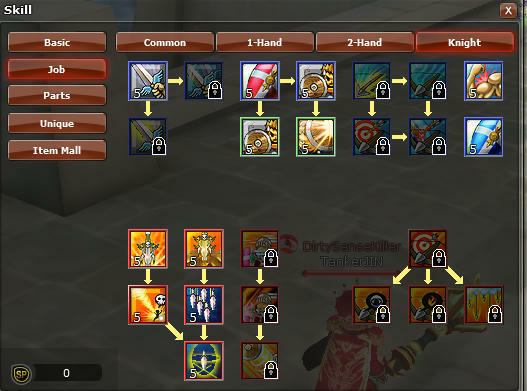 5% let just say debuff their ap from king set and def from royal set out. As I mention above, we don't need high accuracy since on chiva and crit type, we cannot make our accuracy to hit raider properly. So don't need to accuracy passive as well as atsp, you won't do single attack that much to make atsp useful, so you better use in other useful skill. Shield Jab: Shield Stun is required this skill to lvl 5, Howeer this dispell is useful anyway. 1. On Knight Tab, I give up Atsp Passive to get skill i need. Reason, as Knight in CD or war, we dont need more atsp because what you always do is scari, taunt and aoe. You won't do single attack for long duration time like Raider that need atsp. 2. Also get all attack skill on Knight skill tab. Last aoe is Magic attack and it applies taunt. 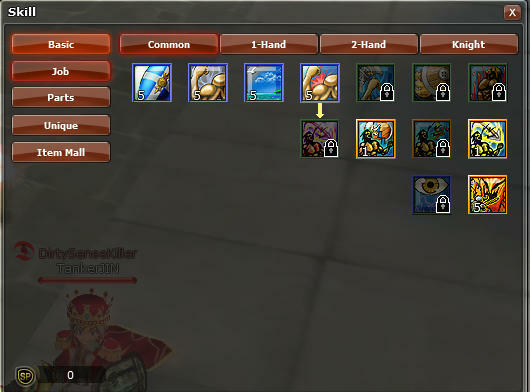 So with crit build will give a lot of dmg when get crit. 3. I get Max Protection to help cleric and mage in our team. Keep using to them whenever it can be used. Imagine when it can protect your cleric 30 secs and have 35 cooldown. Your cleric will have sufficient time only 5 secs. 5. Devastation with 25/50 or can be used gemini (Str/Sen) if you prefer more HP, Def and HP recoery. (increase Str % from stone effect us a lot since this build base Str stat is high. I will have around 11k Def, 2k AP, 2k Critical Rate and 3k block Physical. STR: (Str 425 is included 25Str from Passive, That mean Max Str) It is main stat of Soldier class type. But you may surprise why I have waste my stat point for max str. According to this going to be full ap knight build, that mean you will be losing your def, and hp from gear. So high str, will make yourself have higher hp recovery and hp instead of losing the def. And you still earn your limit of your AP. You will see soon after full buff and wear all gear. Con: This build since I go for full AP, so I choose a bit more accu to be at least hitting better from aoe in War or CD. As you see the benefit of high str for full ap, you also can earn to 164 HP recovery and my HP is 38k with chiva aurum. You will be having good damage as knight and instead of losing def to tank, you get much better hp recovery and 10666 def is not bad to tank. Remember, you save cleric, that mean cleric save you as well. 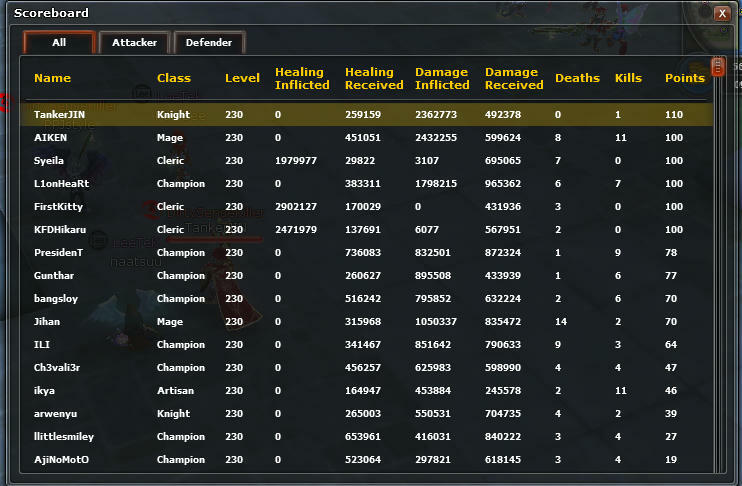 So going to full tank in CD, it is going to be waste dmg you can earn from your magic aoe. Yes, I do boost all my STR by Ruby 7 because I do max my str. So each ruby is giving me another 30 str. You will be earning HP recovery, HP and AP from that. it is better than using D7 for pure AP because you won't be balancing your ap, tank and your duty in CD that you need to save your cleric while spamming your aoe, debuff, sacri and taunt. I won't say anything much in the skill. build tree because it iss almsot the same as the first build. But the different is I take accu passive for the left sp jsut because I need a bit better accu jsut to hit better along with AP build. But however, since this build is going to use full R7 and all AP gear, you won't haveenough accu to hit raider nowadays anyway. Just better accu to hit some mid dodge class. What you do in CD? 1. Just keep your reflect and reduce dmg on as much as you can and keep sacrit. 2. Keep using protection on Cleric or Mage. 3. While Sacri is cooldown, keep using Impact wave to taunt them and other aoe. 4. Try to dispell them when you can. 5. Most Important, if your team has only one cleric, remember to stay close to you cleric because you won't know when raiders will gangbang your cleric. 1H knight may have less ap and dmg outcome on single attack than xbow because they have pierce def passive and more ap. However, this build will make total dmg outcome higher because 1h Knight will get more dmg on refection and this build will make your all aoe crit them mostly. Any question or suggestion to make this build more effective. Feel free to reply. Edited by FireJin, 12 April 2014 - 01:28 AM. Overall a great job on your guide, it's explained very well. There's one thing that you may want to change in my opinion. I see you have shield stun at lvl1 only. At that lvl it is only a 1 second stun, whereas at the final lvl the stun will be 3 seconds long. As we all know, stuns are the strongest form of disabling an opponent, so having this at max lvl could be very beneficial. I'd say either get some skill points from your first attack speed passive (as you've already explained, you don't need it that much), or points from taunt (I'm not too sure about this, but don't you only need lvl2 taunt to access sacrifice?). You could also remove the lvl1 debuffs, since most of the time there's a champion who has them anyway. Edited by FireJin, 04 November 2013 - 10:14 AM. I can use Lv.5 sacrifice with Lv.1 taunt already. This suggestion isn't something that changes your build, but use sword force as well. Since sword force is a ranged magic attack that applies taunt. Soul wreck although also being a ranged magic attack, does not have this taunting effect, so it's usefulness is less than sword force. It's damage is higher though, so you may still want to use it. can you use eb instead of deva? Yep, with this stat, you can turn to AP Knight. Use EB and change some access to AP set. I suggest to use Junon Ring, Hiria Tear and Combat Earing. You can decide to use D7 or R& is up to you. R7 will give you more HP, Def, HP recovery and some AP. But these will be given you like 2.6-2.7k with High full buff. You magic hit will be pretty strong.as Knight Damage Outcome. Edited by FireJin, 16 February 2014 - 12:22 AM. This is a very helpful guide sir. Anyways, I am new to champ stuff so i dont have enough knowledge on what stats or build i use. Can you please make a guide like this with a 2H Champ War/CD? What stats and skill to put so and gear so i can have some idea where to put my SP.. I plan not to provide my 2-hand champ build in public yet since this job is one of my main for PvP other champs.. But if you want to ask some idea, you can pm me in game. Just pm or add me friends on BetaBeater. Son, this is a knight thread. Where you pulling those dragons from? is this still a good build? When talking about knights, there is never a wrong build. Unless you go max int/cha. Mmmm max cha knight buff/protection slave. Tasty. 1H Knight build is not the most important than how you play your Knight in CD. Protection on Cleric and Mage, AoE, Debuff, Taunt,Sacri. Just don't do cha and int build. Right now I am currently use similar build of second one I provide. Edited by FireJin, 24 June 2014 - 07:44 PM. 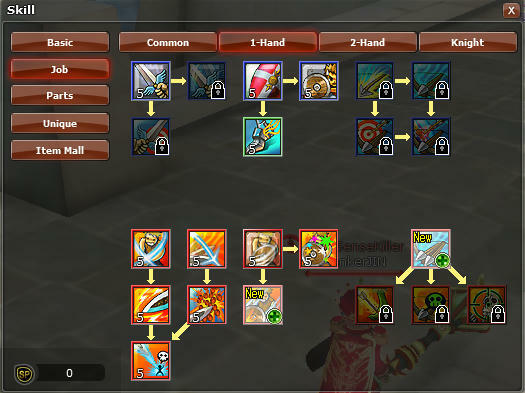 i want a build where i can protect indeed and can do cd with, so the second build you posted is good enough for that? Seriously, playing a knight is so forgiving that you could go any amount of str, con, sen, dex and still do well. Just take a look at the build, see if it looks alright, maybe adjust it a bit towards what you want yourself. Don't just blindly copy anything, guides are there to give people an understanding of the class, not for people to just all copy the same build. As I mentioned before, the build of knight is not that important compare to how you do your duty as knight for team. And as Jeremy said, you don't need to copy all things I posted about build, it is just a guide that my second build suit for what style I play, you can design it on your own play style. Ty for the advise . No, Cd isn't even played anymore. Any new build and items for maxx knights? I mean for attack speed pvp knights.